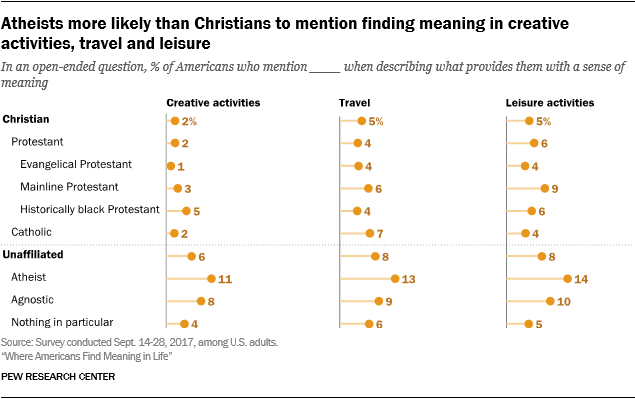 An interesting survey from Pew came out recently that detailed where Americans find meaning in life and it showed a relatively small number mention spirituality or faith. A hot topic in the debate between atheists and theists is where millions of people will find meaning, once they've left religion for atheism. It is argued, mostly by social conservatives, but even by some liberals, that religion is the largest provider of meaning in life and that in the absence of traditional religion the void left by that absence of meaning will be filled by anti-social elements, like drug addiction, and radical ideologies, be they far Right or far Left. Well, Pew's survey seems to challenge that perspective, at least somewhat. Despite Americas being seen as a highly religious population among the Western nations, only 20% of the respondents in the survey even mentioned spirituality and faith as something that provides them with a sense of meaning. Family by far topped the list, with nearly 70% mentioning it, followed much lower by career and money, at 34% and 23% respectively. Despite the fact that when the survey is measured by what is the most important source of meaning, faith comes in second, I am positive that these numbers will be decreasing in the next few decades due to the ongoing rapid secularization of the US. And not surprising, black Americans mention spirituality the highest of 3 racial groups, corresponding with the known high levels of religiosity among them. Age-wise, the survey affirms the decrease in religiosity among those who are younger, with only 10% of those who are 18-29 mentioning faith and spirituality as providing them a sense of meaning. Regarding religious faith itself, the differences between the generations are even more dramatic. Those are are college educated find more meaning in learning. This seems to make a lot of sense, as someone interested in learning is probably more likely to go to college in the first place. About a quarter of college graduates (24%) and those with household incomes of $75,000 or more (23%) mention being in good health when describing what gives them a sense of meaning. So what gives me meaning? Where would I fall on this survey? I would tend to align with what many liberal, college educated people find meaningful in life: social and political causes, as well as hobbies and learning. I'm not a family oriented person. My friends give me more comfort than my family does. And learning perhaps gives me more meaning than anything else. I can spend hours every day on Wikipedia gobbling up information, Googling random facts, and pouring over data sets online. Recently I just spent an hour on the University of Virginia's racial dot map, to see the racial geography of where Americans live. The internet has made data geeks like me have endless hours of entertainment. In fact, the main reason why I want to live longer is to just see what discoveries humanity makes. I'm also making a documentary on free will, the first feature length documentary dedicated exclusively to the topic. Making this documentary in recent months has given me motivation to get up and live another day. I've found that having short term projects to work on that I'm passionate about has given me tremendous meaning in my life. If I couldn't participate in such hobbies, I'd find it difficult to find meaning in life. Lastly, I don't brush off the concerns of those like Douglas Murray who, while an atheist himself, worries about the ideas filling the void left by the absence of religion. Almost a year ago I wrote a post about social justice becoming the new religion of the Left. This survey affirms our suspicions that many liberals find meaning in social justice, which has replaced spirituality and faith. There are no doubt obstacles ahead of us here, but going back to traditional religious belief is never the way forward. That will always be the way backward. I offer some suggestions on how to move forward in a series of posts starting here. Selected As One Of The Top 30 Atheist Blogs Every Atheist Must Follow! Welcome to Atheism and the City. This blog is about exploring atheism through contemporary urban living. I live in New York City, the secular metropolis, and I have an avid interest in all things religion, science, philosophy, politics, and economics. I am an atheist, a humanist, a philosopher and a thinker, and the purpose of Atheism and the City is to write about my thoughts and experiences on the subjects and topics that I have a passion for. Feel free to respond to any post whether or not you agree. Going on Internet Hiatus for 4 Months!